Reveals that survey work had been completed along the Alaskan coast and along the border with Canada, but not in the interior of the territory. U.S. Coast and Geodetic Survey. Condition of Field Work Alaska. June 30, 1926. 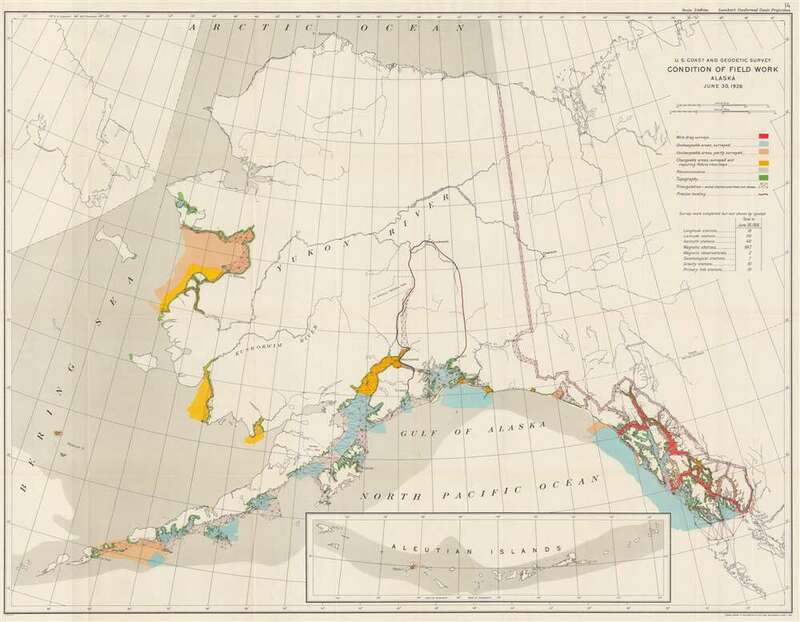 This is a 1926 U.S. Coast and Geodetic Survey map of Alaska. The map depicts Alaska from the Bering Sea to the Yukon Territory and British Columbia in Canada and from the Arctic Ocean to the Gulf of Alaska and the North Pacific Ocean. An inset map of the Aleutian Islands is situated along the bottom border. Created for the Annual Report of the Director, United States Coast and Geodetic Survey of 1926, the 'condition' of field work accomplished by the agency is illustrated, using different forms of notation. 'Condition' means the total amount of field work accomplished to date. Hydrography surveys are depicted in light blue and have been completed in the Alexander Archipelago and in the bays near Cordova, Valdez, Seward, Anchorage, and Kodiak, as well as in places along the Alaska Peninsula. Other hydrographic surveys using the wire drag method and are illustrated in red, which have also been undertaken in the Alexander Archipelago. In wire drag surveys, a wire is attached to two ships or boats and set to a certain depth by a system of weights and buoys. The wire is then dragged between two points, and if it encounters an obstacle, the wire becomes taut and forms a 'V'. This reveals submerged rocks, wrecks, and other obstructions with more accuracy, along with an accurate reading of depth. Hydrographic surveys along the Alaskan coast have also only been partially completed, which are shaded in a peach color. An intriguing distinction is also made with respect to the hydrographic surveys conducted in Alaska. Per the map, some of the areas are changeable, which, accordingly, have been surveyed but will require future resurveys. These areas are depicted in yellow. Topographic surveys, which have only been conducted along certain coastal areas, are illustrated in green. Triangulation surveys are depicted by the red interconnected triangles and have been conducted along the border between Alaska and Canada and extensively in the Alexander Archipelago and the bays near Cordova, Valdez, Seward, and Anchorage. Triangulation surveys have also been conducted along the coastline between St. Michael and Nome. Reconnaissance work has also been completed extensively in the Bering Sea and also in the Arctic Ocean and around the Aleutian Islands. A key explaining the different notations utilized on the map is located at the top right, and a table just below the key lists other forms of survey work completed in the region. The table states that extensive survey work has been completed in Alaska, particularly the nearly 850 magnetic stations that have been established. This map was produced by the U.S. Coast and Geodetic Survey for inclusion in the Annual Report of the Director of the Coast and Geodetic Survey. The director in 1926 was E. Lester Jones. Jones, E. Lester, Annual Report of the Director, United States Coast and Geodetic Survey to the Secretary of Commerce for the Fiscal Year Ended June 30, 1926 (Washington: Government Printing Office) 1926. Very good. Slight wear and toning along original fold lines. Blank on verso.